Education: Univ. of Glasgow, then Cambridge. William Thomson was born on 26 Jun 1824 in College Square East, Belfast, Ireland, the second son of four children. His mother died when he was six, and when aged eight, he moved with the family to Glasgow (1833) where his father, James Thomson, had been appointed as professor of mathematics at the University of Glasgow (1832). He was an infant prodigy in mathematics, taught by his father until, by age 10, he entered the University of Glasgow in 1834. Guided by his father's interest in his education, Thomson studied at Cambridge University (1841-1845). He then did postgraduate work in Paris with Henri-Victor Regnault, including study of science demonstration techniques. Throughout his education, Thomson demonstrated excellence and published scholarly papers on mathematics, the first when he was 16 ('On the Figure of the Earth', 1840). When he became Professor of Natural Philosophy at Glasgow University in 1846, at age 22, he held the position for half a century. It was here he would create the first physics laboratory at a British University. Also in 1846, he estimated the age of the earth—based on creation at the temperature of the sun and the rate of cooling for a body of the size of the earth—to be around 100 million years. It was only later that there was knowledge of the heating effect of the radioactivity in the earth’s core. So, he stubbornly defended this calculation throughout his life, and contested Darwin’s conclusions on evolution as impossible in the time period. Kelvin’s other interests in heat, though, were productive and correct. He first defined the absolute temperature scale in 1848, subsequently named after him, which was the first scale based on a completely general natural law. In the same year, still in his early 20’s, he was made a member of the Royal Society. In 1851 he published ideas leading to the second law of thermodynamics and supported his friend James Joule’s mechanical equivalent of heat. He changed the view of heat as being a fluid to an understanding of the energy of motion of molecules. The term “kinetic energy” was coined by Thomson in 1856. The names of these two scientists are linked with the famous Joule-Kelvin Effect (1852) which makes refrigerators work. Kelvin's name is also immortalized by the Kelvinator fridge. While at Cambridge, Thomson had published 'The Uniform Motion of Heat in Homogeneous Solid Bodies, and its Connection with the Mathematical Theory of Electricity,' (Cambridge Mathematical Journal, vol. iii. 1842.) By applying this analogy of heat flow to the flow of electricity, in 1854, he joined Cyrus Field’s efforts to lay a transatlantic telegraph line. He improved the design of the cables, even traveled on the ships supervising the laying of them. This experience prompted Kelvin’s invention of the mirror galvanometer (patented 1858) as a long distance telegraph receiver which could detect extremely feeble signals. He studied the electrical losses in cables, and improved the mariner's work with the invention of an improved gyro-compass, new sounding equipment, and a tide prediction with chart-recording machine. He also introduced Bell’s telephone into Britain. Preface to Elements of Natural Philosophy (1873), with co-author Peter Guthrie Tait. He stayed with the transatlantic cable project despite problems, setbacks and the need to restart more than once. With the breadth experience acquired, he now became wealthy from consulting on the subsequent submarine cable projects of others. Thomson published more than 600 scientific papers and filed a total of 70 patents. He was the president of the Royal Society from 1890 to 1895. Presidential Address to the Birmingham and Midland Institute, Birmingham (3 Oct 1883). In 1866 he was knighted because of his achievements in submarine cable laying. 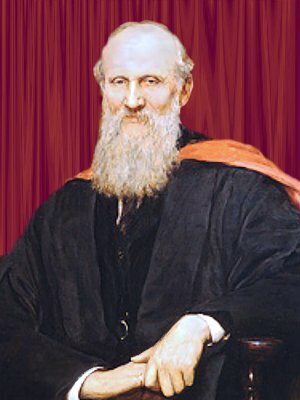 In 1892 he was raised to the peerage as Baron Kelvin of Largs, which title he chose from the Kelvin River, near Glasgow. He was Britain's first scientific peer. When he died in 1907, he was buried next to Isaac Newton in Westminster Abbey. The background to this page shows a modern solution to Kelvin's equal-volume foam space-filling conjecture. 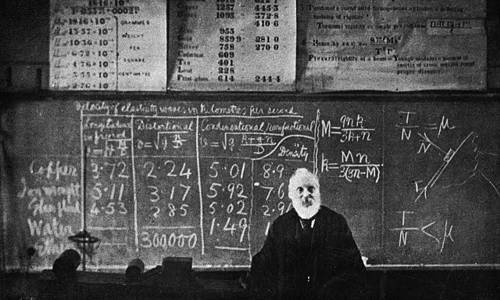 In 1887 Lord Kelvin posed the problem of finding the partition of space into equal volume cells minimizing the interface area. He suggested a foam formed as a relaxation of the Voronoi cell for a BCC lattice, with cells that are congruent truncated octahedra. In modern years, Robert Phelan and Denis Weaire of Trinity College, Dublin, have found a structure using two types of cells that has 0.3% less area than Kelvin’s foam.